Moodle is the open source platform popularly called as LMS (Learning Management System). It also called as CMS (Course Management System) that lets you build the perfect education solution for your needs. 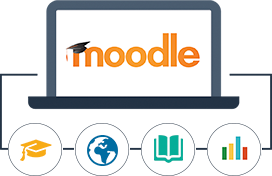 Moodle provides the most flexible tool-set to support both blended learning and 100% online courses. Because it is open-source, Moodle can be customized in any way and tailored to individual needs. There are plugins for different kinds of content, and plugins for all kinds of collaborative activities, which is where Moodle really shines. Dart Innovations with in-depth knowledge on e-learning and LMS can help you customize Moodle to any extend. We can build a new Moodle site and customize on your need which may be a simple course management site or feature-rich e-learning portal. Our qualified Moodle developers are known for leveraging their hands-on experience in crafting Moodle applications and websites that help you to attain your business goal. We help you build your specific Moodle theme matching with all industry standards and latest web styles. Our custom theme development service can just not improve the look where it also increases the user experience. It is very important to automate the way your user joins and renews the course fee. Our in-depth knowledge with Payment gateway integration can help you do that. We help you choose a best plugin with your preferred gateway and if there is not one then we develop using the API within the Moodle framework. E-learning course development is one of our specialized services that we are expertise in creating such Flash based, HTML5 based simulations as well any interactive courses. Your courses may be a corporate training, social training or kids learning where we have all around experience and can present in such way. Our team with experience more than 17 years on the e-learning domain knows all requirement around the learning system. We are special with moodle knowing each corner around it’s framework hence we can develop any type of modules and plugins that suits your need. Our maintenance module can help you keep your Moodle LMS up to date and running good. We can support you on maintaining both servers as well Moodle application. Simply get it healthy with our Moodle Support & Maintenance module.